Your MDM Strategy Has Failed. Now What? In a BYOD world the premise of MDM is simple; to protect the data which may be present on an employee’s device the organization must take control of the entire device. 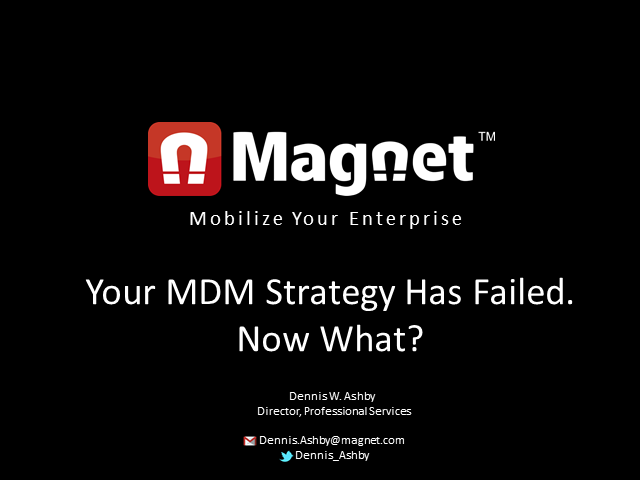 And yet, despite years of effort, many organizations are faced with a failed MDM strategy and wondering what's next. This webcast will address where and why MDM failed and propose that Mobile Application Management (MAM) is a better, and more right-sized solution for the Enterprise. This webcast is for Mobile Directors, Business Stakeholders and IT decision makers looking to understand how to transform their businesses into Mobile First organizations. Mobile devices have revolutionized the way we access information, interact and transact; mobile is no longer just about email, calendar, maps and games. Mobilizing the Enterprise has become strategic.